It's now Saturday morning, and Scott and I have started on the long slog to Fort Wayne. I have no idea why we chose to go through Warsaw; perhaps Scott wanted to take me by the old Rural Radio Network site in Wethersfield. In any event, this sign had been discussed on misc.transport.road not long before I left on the trip, so we went to go see it in person. 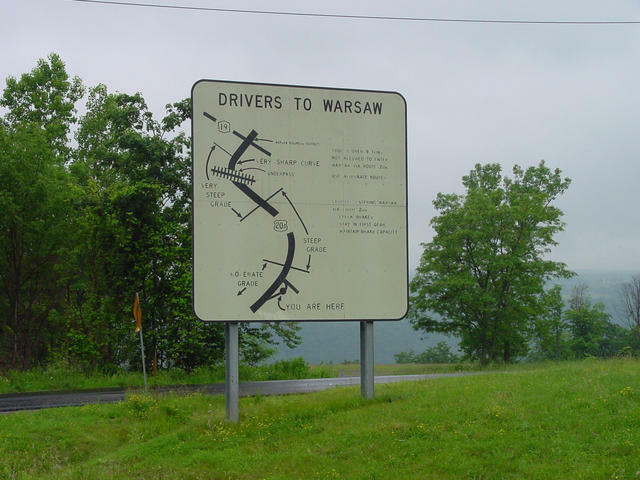 This little turnout (designated by the "YOU ARE HERE" on the map) is a mandatory stop for westbound truckers on US 20A heading into Warsaw. We weren't driving a truck, but we were curious and so we stopped. Copyright 2001, Garrett Wollman. All rights reserved. Photograph taken 2001-06-23.